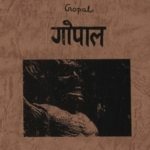 The only recording by the mysterious Nepalese psychedelic artist Gopal. Dating from the time Tsuyama was wandering around the globe, this miraculous tape features a live collaboration. Recorded in Nepal in 1979.